The GT6, as a true sports car has been, and is still being successfully raced. 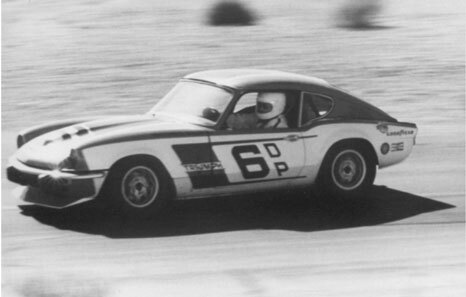 The first potential racing GT6 was the stillborn GT6R, of which only three photographs survive, see below. To quote from Works Triumphs In Detail by Graham Robson "After the 1965 Le Mans 24 Hours, technical chief Harry Webster realised that the works racing Spitfires had nothing else to prove. Race speeds had rocketed so far in just 2 years that it was unlikely that homologated Spitfires would ever be fast enough to qualify to start the 1966 race. 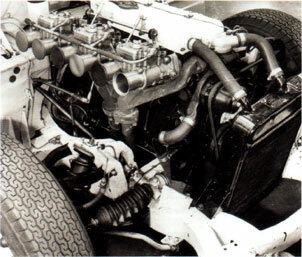 If they were to be raced again, the existing layout would need to be improved by spending heavily on a larger, more powerful engine, different rear suspension and perhaps an unique body style. For a time, therefore, some thought was given to entering cars as GT6 prototypes, with the 2 litre 6 cylinder engine that the production GT6 was about to inherit." 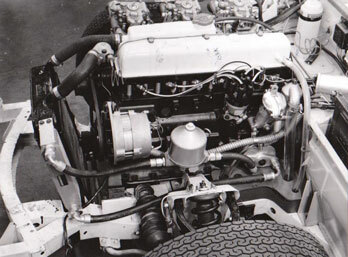 A prototype was built up by Ray Henderson with Weber carburettors and put out around 170bhp, but following the debacle at the 1966 Monte Carlo Rally where the winning Mini's were disqualified on a technicality, Donald Stokes halted the racing program and the prototype was broken up. Or was it? A bodyshell did survive and was discovered in Cheshire in 1981. To find out more click here. According to Fabrizio Comi "the starting point for the GT6R project was the ADU5B in a Tour de France setup with a steel bodyshell, panel doors made of aluminium, the Le Mans bonnet with the central panel in aluminium, the front wings in fibreglass and without the bulge in the middle that would later characterise the bonnet of the standard GT6". The first two of the above pictures (all taken by the resident S-T photographer) are from 'Works Triumphs In Detail' by Graham Robson, the third is from the Canley Classics website. The above picture is from Jon Wolfe's Classic Racing Pages. Jon Wolfe, Driver/Owner has had outright wins at the Nordschleife, Monza and Brands Hatch and many class wins in FISC and CSCC Swinging Sixties. 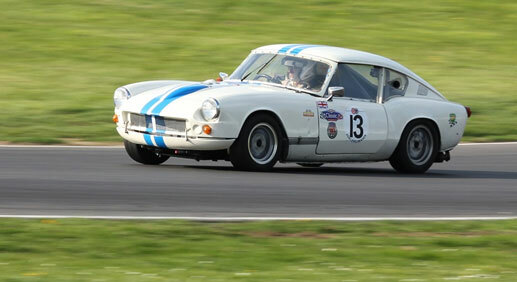 He's the winner of Class C in 2008, 2009 and 2010 CSCC Swinging Sixties race series. Click on the picture above of his "awesome Triumph GT6 Mk II" to visit his website in a new tab, where you can see the full and impressive specification. R.W. 'Kas' Kastner started the USA Triumph Competition Department for the Triumph factory in the early 1960's. He authored the Triumph Preparation manuals distributed by the Triumph factory in the 1960 - 1972 era of production car racing. He is well-known for his pursuit of power increases for the Triumph cars with long experience in engine dynamometer testing. 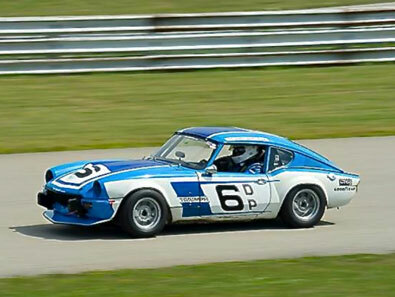 Although he resigned in 1970, to run his own company, Kastner-Brophy Inc, he helped Triumph to prepare the GT6 for the Sports Car Club of America (SCCA) class E-Production. The GT6 won the championship in 1969/70, hence the plaques on the dashboard! To visit his own website click on the picture below. 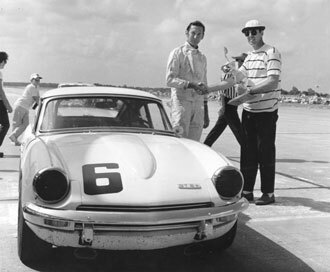 This picture is of Carl Swanson somewhere around 1970 winning a race in Texas with the GT6. Copyright © 2012 Kas Kastner. A Kastner-Brophy GT6 Mk3 won two big races in 1972, and the car (see below in period, and in 2016) now belongs to James Dolan. He "bought the car after talking to the seller and it was as advertised. We had a bit of race prep to bring things up to date with new belts, fuel bladder, brakes system rebuild, and we were ready to race. I tracked down Kas Kastner and obtained a lot of history about the car. Kas was a great guy, he told me all about what to look for to confirm it was his prior car. Then we spent a lot of time at the Kastner Cup race telling stories. A real gentleman". Formed during the early-1960s by Bob Tullius and Brian Fuerstenau, Group 44 Inc. remains one of America’s most successful racing teams, with its cars renowned for their distinctive green and white liveries, impeccable preparation, and countless victories. 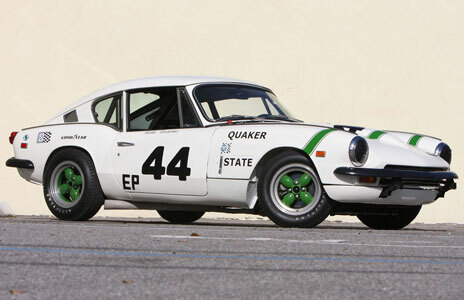 This ex-Group 44 Triumph GT6+ was driven in period by Mike Downs, Brian Fuerstenau, and Bob Tullius, and secured the SCCA National Championship at the American Road Race of Champions (ARRC) at Daytona in 1969, where the GT6+ swept the E-Production podium. 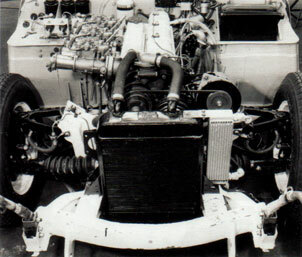 In 1970, this car won the D-Production pole at the very first SCCA Runoffs at Road Atlanta. Sponsored by Quaker State, Champion, and Goodyear, it was also featured in dozens of ads and stories in many event programs and publications, including Road & Track, Sports Car Graphic, and others. It was also Triumph's display car at the 1970 New York Auto Show. The current owner acquired the GT6+ as a "barn find" in 2005, and Lanky Foushee, the Group 44 Inc. crew chief from 1970 until the team's disbanding, confirmed its identity. A complete and authentic restoration followed, with the car returned to nearly exactly the way it appeared in the winner's circle at Daytona in 1969, with careful updates to make it track-ready today. The entire process was carefully documented and covered by Classic Motorsports magazine. In 2009, the car won the Amelia Award at the Amelia Island Concours d'Elegance before participating in the Monterey Historics that August. The restoration was performed to such a high level that former Group 44 Inc. team owner Bob Tullius deemed the GT6+ worthy of his standards when he saw it at the Lake Mirror Classic concours last fall. Perhaps Lanky Foushee said it best recently, "This was the little car that could…until the Triumph TR8 came later, this was my favorite car in our stable. The restoration was great. You guys did a super job." We could not agree more. To read an article about the restoration click here.